Not only do we get to play with a completely new group of awesome and cuddly players, we also get to revisit D&D. We haven’t gotten to spend any quality time with our first RPG love in ages, so it’s been lovely to get re-acquainted with the system and so see how it’s evolved. I’m glad to see it’s gotten a lot better! (That, or our GM Bart is shielding us from the horrible truth). Bart runs a very well organised game, and this is also reflected in our character sheets and props. 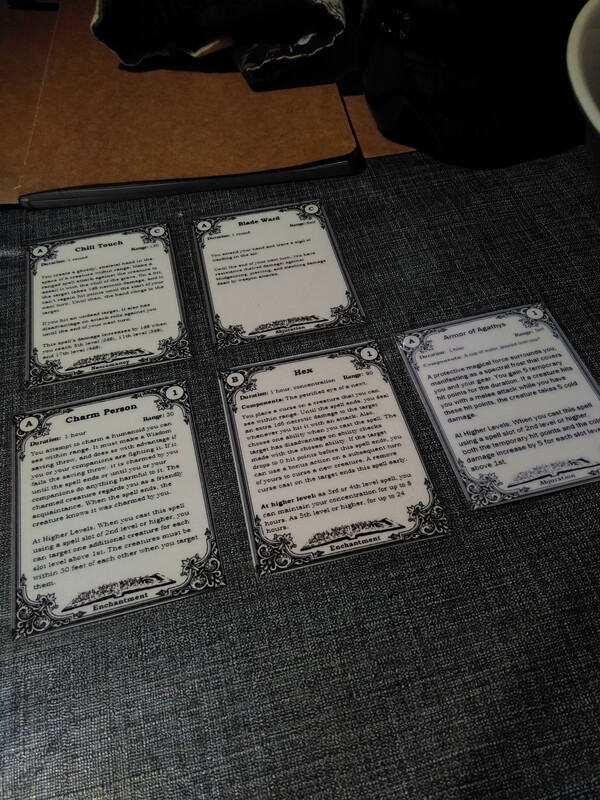 My warlock has received plasticized cards for all her spells, we get updated sheets every level. 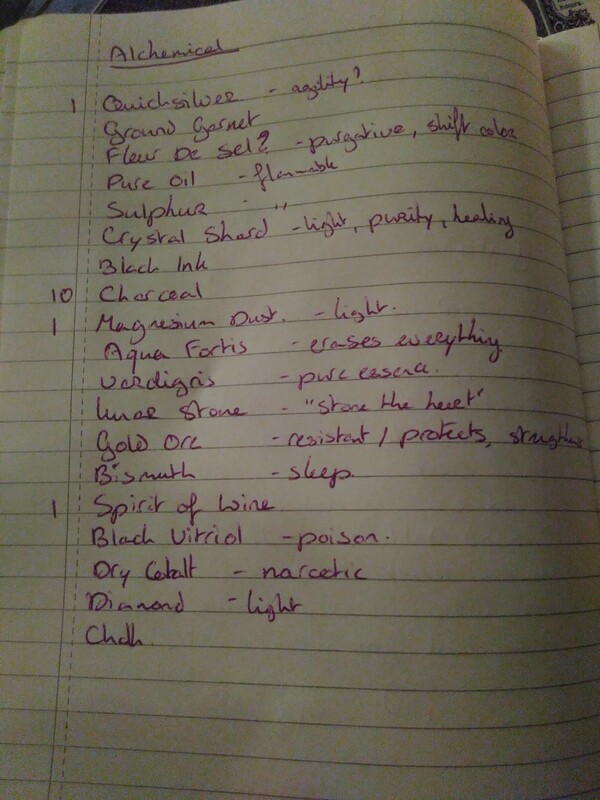 They are stored in our personal envelopes with our spell books, our highly detailed alchemy book and pencils. Some service! For alchemy we are using the system from Skyrim: we have a book of ingredients divided among three types, and to make a potion we simple need to combine one ingredient of every type together and find out what it does! This has lead to many entertaining scene of ingredient collection and potion roulette! For our Dinner with Strahd session, Bart had us wait in the hallway until all the players had arrived. When we had gathered our party, we were lead upstairs and found a full set dinner table, and our friend Tim was there as a surprise guest. He was Strahd! All the players were too stunned to say anything for the first 10 minutes, leaving Tim to do a lot of talking :-) It didn’t help that Bart was playing the butler and serving us an entree of fried mealworms and grasshoppers! The dinner actually went fairly well. We managed to learn a lot about Strahd, and we got out of a nasty game he had prepared for us (for now). So.. all’s good in Ravenloft! (for now).